ONE-DAY SEMINAR ON "INTRODUCTION TO MECHANICAL SPLICES" AND "PRECAST LIFTING AND CONNECTIONS"
In-collaboration with Halfen-Moment Sdn. Bhd. This is a half-day specialized workshop providing intimate understanding of mechanical splices (also known as rebar couplers) which has been used as a method of splicing reinforcing bars for many decades but still not widely practiced within the construction industry, where the traditional method of lap splicing of reinforcement rebar is still being practiced. This workshop will present the different types of couplers in the market, with different benefits and applications. This knowledge can be applied by practicing engineers, consultants, designers, and the industry to broaden their knowledge on how mechanical splices can play a big role in simplifying the design of reinforced concrete, speeding up construction and reducing the amount of reinforcement required. In the precast industry, three things count when components weighing several tons are transported or movable roof structures are shifted or entire buildings are held together: Safety. Safety. Safety. It always has to do with the efficient movement, reinforcement, fastening and connecting of concrete. It is important that precasters should only rely on certified lifting systems when it comes to safety. As the overall stability of a precast structure depends largely on its connections, it is important to consider the effectiveness of these connections in transferring the forces between individual building elements and to the stabilizing cores and foundation. The detailing of connections should satisfy the requirements with respect to the manufacture, transport and erection of the precast units. It should be designed for simple assembly and details compatible with the overall requirements for the building so as to achieve a shorter construction time. 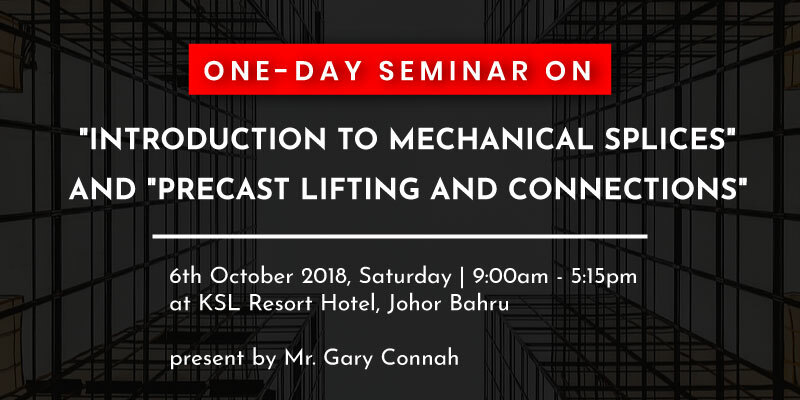 This half-day specialized seminar will provide understanding on the different types of precast lifting and connections available in the market for different applications. This knowledge can be applied by practicing engineers, consultants, designers, and the industry to broaden their knowledge on how these innovative solutions can play a big role on safe lifting design, precast structural integrity and shorter construction time. Mr. Gary Connah is a Chartered Professional Engineer and currently holds the position of Technical and Development Manager of CRH Construction Accessories Asia, based in Singapore. He graduated from Loughborough University in the UK in 1996 and has gained extensive experience in mechanical splices as well as post installed and cast in anchor solutions in Europe, Asia and Australasia. As the ex-chair of the Construction Fixings Association in UK, he actively contributed to current anchor Approval guidelines in Europe and until recently held the position of Chair of the AEFAC technical committee; an industry initiative seeking to enhance the specification, selection, design and installation of structural anchors and fasteners in the Australian construction industry.